I drove over 5 hours round trip on Saturday to attend the annual Kansas Art Quilters (KAQ) meeting. Nineteen people showed up, which is not bad attendance for a group in our situation. For those of you who do not know, Kansas is right in the middle of the United States and covers a very large area, about four times the size of Slovakia. Driving from city to city can involve many hours of driving time, so not all members are able to attend. Despite its name, the group is actually a national one, with 65 members from 14 states. At one time, we even had a member from Norway. A large part of our national success has been due to the efforts of Linda Frost, the outgoing chair of the Exhibitions Committee, who did an amazing job of finding us excellent exhibit venues for a number of years. 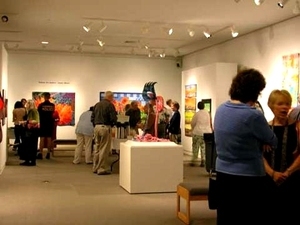 Here's a picture from one of our recent opening receptions at the Sabatini Gallery in Topeka. At the end of 2000, I attended a Studio Art Quilt Associates (SAQA) conference in Santa Fe, New Mexico. SAQA is the international organization for artists who work with quilts as their medium. During a break, I found myself talking to three other Kansans, including Charlotte Herr, Phil D. Jones and Linda Frost. At one point, I made a comment that I'd always thought the quilt artists in Kansas should get together and have an exhibit. Light bulbs went off over our heads and we decided to form a group. The next day, we met at lunchtime and made plans. Each of us knew another art quilter or two, so we started passing the word along that we were going to have our first meeting in January, 2001. Phil said we'd probably end up with 10-12 people sitting around a living room. I collected names and contacted people who might be interested, based on tips given to me. To our great surprise, we had 40 people turn up at the first meeting. KAQ has grown and changed a lot over the years. I was the first president and now I'm the communications coordinator, maintaining the website. What hasn't changed is the talent in the group. Linda and I are the two founding members still left, but many, many other people have also stepped up to make KAQ work. Thanks to everyone who has done so, including the outgoing board members.